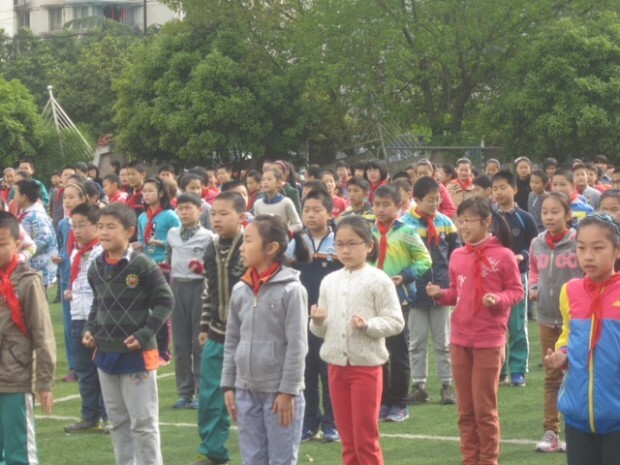 For the past few days, the students have been at the Qiushi School with their host siblings. It was impressive to see our students marching and doing morning exercises out on the athletic field with the other 1200 students at school. Even with the huge number of students, everyone was organized into perfect lines and synchronized with the exercises. Our students have participated in many different classes such as math, science, computer lab, PE, Chinese, art, calligraphy, and English. I was happy that two of my students were in the English class I taught, and they were able to help. I did an SEL (Social Emotional Learning) lesson with the class, and it was evident that this was very different than what they normally do in school in China. Wednesday afternoon, there was extended sports practice, and some of our children got to work on their Kung Fu skills, as well as soccer and other activities. There was also a basketball game between the Chinese students and the ones from ISTP. It was fun for everyone. On Wednesday, the chaperones had a discussion forum with some of the Chinese faculty on education in our two schools. It was interesting to see both the differences and similarities in our methods. Many of the Chinese teachers had watched my SEL lesson in the morning, and this sparked a good discussion. They wanted to know how we assessed this type of class without a formal test. We discussed our different assessment methods, and we showed them an example of a rubric that could be used for a 5th grade writing project. They were very interested by all of this, and it seemed that as a public school, they have more restrictions with how they must assess their students. We also discussed the amount of time they spent in class per week and how many characters they were expected to learn by certain points in their schooling. Overall, we had a great discussion, shared some good ideas, and are now able to understand each others' schools must better, just like the students understand school better here after spending time in class. On Thursday morning before lunch, our students had a special lesson on the history of dumplings and how to make them. Dumplings were originally invented by a man named Zhang Chuang Jin. He noticed that the poor people were getting frostbite, so he made these dumplings that contained herbs, meat, and chili peppers. Two of them were put into left over soup, and they were given to the poor people for 15 days to warm up their bodies and prevent frostbite. After the history lesson, all 17 of our students along with one of the 5th grade classes made dumplings. Some of the dumplings were traditional shapes, but the teacher also challenged the students to be as creative as possible and make their own shapes. She was impressed with their creativity. They made bats, snails, and even a table. After some recess time and a soccer game outdoors, the children had all worked up a hearty appetite. They then came inside to eat the dumplings they had made. Everyone thought they were delicious, and most of them ate at least two bowls. It is already Friday here, and the students are at the Qiushi School for their last day. This afternoon the Chinese students prepared a performance for us, and our students took part in it too. There was singing, dancing, Kung Fu, and games. There was also a raffle for small prizes like pens or small games, and the children were thrilled with the prizes they won. A few of our boys and some of the Chinese boys performed and danced to Gangnum Style. We all had a lot of fun, and the afternoon ended with lots of hugs and a group photo. We've had a wonderful time at school, and tonight the children will spend their last night with the host families before we head to Wuxi, Suzhou, and finally Shanghai. We can't believe how fast this week has flown by!